Judy Smith gives Carrie Sorrell a treatment with a K laser at Polson Family Chiropractic. POLSON – Those in need of some soft tissue healing have another option. Polson Family Chiropractic recently began offering K-Laser treatment. The K-Laser uses frequencies and an infrared light to stimulate the body’s tissue and bring oxygen and water to the affected area. Blood then removes waste products such as lactic acid and carbon dioxide. Much like photosynthesis in plants, light energy passes through the skin into the cell membrane initiating a process called “photobiostimulation.” This process enhances the body’s natural regenerative functions, as well as stimulating the release of endorphins and collagen. The treatments, which can last from 3 1/2 to 20 minutes, don’t do anything that the body doesn’t do already, it just does them faster, said Dr. Pam Sandall. She notes the Federal Drug Administration approved the K-Laser in 2003, but said Polson Family Chiropractic is the only place that offers it in the Mission Valley. 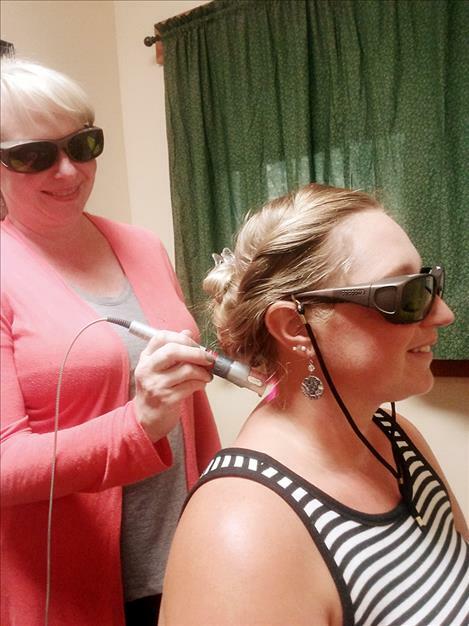 Laser tech Judy Smith treats patients with the device, but has also received benefit from it. She received chiropractic adjustments for a painful shoulder and also used essential oils without success. However, after just two treatments with the K-Laser, Smith said her pain went away. “I was amazed,” she said, adding that her shoulder had been hurting for six months. The treatment, which is painless and comes with no side effects, is recommended before one gets surgery, but it also can promote healing after surgery, Sandall said. It can be used to supplement chiropractic care or by itself. In adults it can be used to treat wounds and relieve pain, swelling, stiffness, spasms, limited range of motion and various maladies from head to toe. Children can benefit from the K -Laser for tonsillitis or ear infections, for example. The cost is $50 per treatment. For more information about K-Laser treatment, contact Polson Family Chiropractic. The business is located at 801 Fourth Ave. E. Their phone is 883-4216.